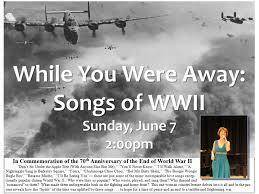 During WWII we Americans kept our hopes and spirits high with the new songs that blossomed during those dark years when we were losing the battle to Germany’s Hitler and Japan’s Hirohito. 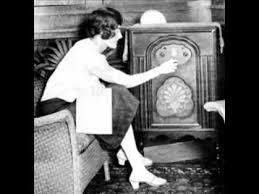 World War II was the first conflict to take place in the age when almost ninety percent of American households had radio. Never before had songs been so widely available. Never before had the number of listeners been so high. 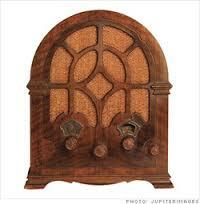 Overseas, American troops had access to radio in all but the most difficult combat situations. 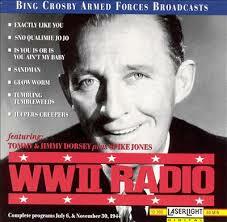 Between bouts of combat our troops listened to popular music on Armed Forces Radio. 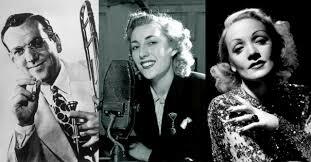 The song, They’re Either Too Young or Too Old took a light-hearted look at the men left for the women on the home front while our troops were away fighting the war. 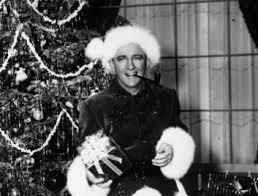 Popular songs like Sentimental Journey, I’ll Be Seeing You, Moonlight Serenade, and I’ll Be Home for Christmas, spoke of women’s longings for loved ones overseas and the troops yearning to be home. Those songs gave society’s blessing that it was okay to miss your man because he fought for the good of all Americans. 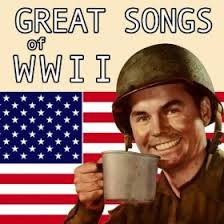 The many patriotic songs brought smiles to faces and pride to the hearts of Americans on the home front and abroad. Americans held the same desires as their leaders, and the government counted on popular music to reflect the same war aims that Franklin Delano Roosevelt wanted. Everyone hoped for a quick victory over the Axis, and the songs about a world after the war with the boys coming home met those wishes. This unity gave the USA enormous energy that allowed the nation to accomplish far more, at less human cost, than the other major powers in the war. So, during the dark years of the war where almost every citizen lost a loved one, music kept spirits high. Have you heard any of these WWII favorites? If so, which is your favorite? ANNE GREENE delights in writing about alpha heroes who aren’t afraid to fall on their knees in prayer, and about gutsy heroines. Her novellas, A CHRISTMAS BELLE, and A GROOM FOR CHRISTMAS are now available. 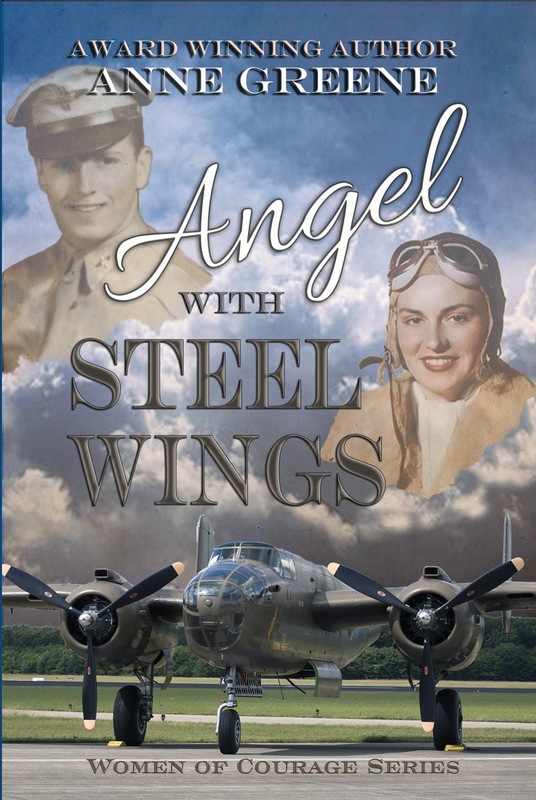 Her Women of Courage Series spotlights heroic women of World War II, with the first book ANGEL WITH STEEL WINGS available. Enjoy her private investigating series, Handcuffed In Texas by reading the first book, Holly Garden, PI, RED IS FOR ROOKIE. Try her award-winning Scottish historical romances, MASQUERADE MARRIAGE and MARRIAE BY ARRANGEMENT. Anne’s highest hope is that her stories transport the reader to an awesome new world and touch hearts to seek a deeper spiritual relationship with the Lord Jesus. Buy Anne’s books on http://www.Amazon.com. Type in Anne Greene. 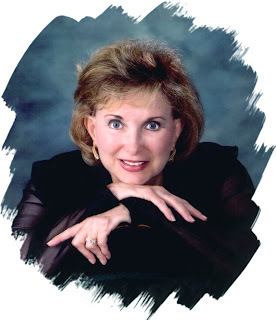 Visit Anne at AnneGreeneAuthor.com. and at @TheAnneGreene. Probably the ones I've actually remembered hearing are "Bugle Boys" and "Don't sit under the apple tree". There sure was a disparity between songs like "Bugle Boy" and the more melancholy songs. Perfectly summarizes the angst of sending your loved ones off to war. Yes, those days were all about disparity, disarray, and despair. Hard times. Good to see you here. I love your post! So many wonderful songs! 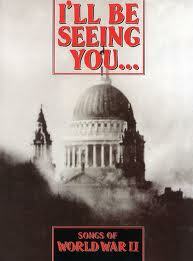 I'll Be Seeing You is a good one. Those song helped many people get through a very difficult time. Yes, Melanie, those songs help people so much during those dark days. I love having people read my column each month. Thank you! Thank you for this fascinating post. I'll Be Home for Christmas gives one a sense of hope in a dark time. Yes it did. And today we sometimes hear that song and gain the same hope. Great song. Thanks for enjoying my post. I am familiar with many of the songs you mentioned and some of them are very sad if your loved ones aren't with you. I loved to watch the old "canteen" movies to see the different movie stars and hear the songs they performed. The plot was always the similar: Movie stars, singers and celebrities gathering to help the war effort and cheer up the troops! Thanks for reminding me!! Hi Connie, It's good to bring back old memories. I saw a number of those old movies as well. Great to have you visit with me. Thanks Kim, I try to have an interesting post on the 14th of each month. I hope you'll join me again. I listen to WWII songs while I write, since I write WWII. My favorites are I'll Be Seeing You and Coming In On a Wing and a Prayer. Hi Terri, You enjoy some of the same songs I do. I hope you have great success with your books. Nice to visit with you here! Oh, and Terri, I wrote WWII books long before editors accepted the 1940s as historicals. Back then WWII was a hard sell. Funny, how long it took for editors to accept WWII. Now I see books in the 1970s touted as historicals. But songs become historical far sooner. Did you know the songs of the 1980s are now classed as OLDIES? And it is difficult to find songs from the earlier eras. Rock N Roll is as extinct as The Big Band Sound and Swing. I've heard of many of these songs, mostly from watching old movies and listening to jazz music from that time. I like "Be careful, it's my heart". Thanks for the interesting post! Hi Linda, Yes, I haven't heard that song mentioned on the radio or TV in a long time. Great song. I'm so glad you like my post. I hope you come back often and visit. 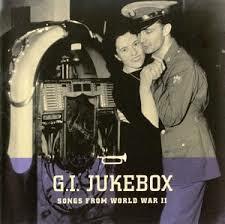 I've heard of most of the songs mentioned and have some cd's of songs from the '40's, including Big Band music. 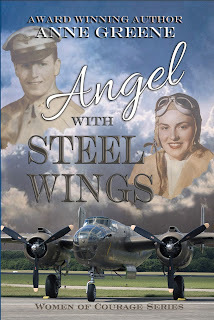 I love the WWII era and it stories, and would love to read 'Angel With Steel Wings'. Thanks for the interesting post and giveaway opportunity!! Thank you for visiting, Bonnie, I'm afraid I think so many of today's songs are mere noise and bad lyrics. I hope you read Angel, you will love the romance and the era. Your name is in the hat. Hello friends, thank you all for visiting! I pulled CARYL KANE'S name out of the hat. Caryl, I'll email you to find your address and then send you an autographed copy of Angel With Steel Wings. Congratulations. I am so excited! Thank you so much!